Research in Motion’s second quarter earnings beat the Street on Thursday but not by enough to quell pessimism about the company’s longterm future. The Waterloo, Ont. maker of BlackBerry smartphones and PlayBook tabletsposted a Q2 fiscal 2013 loss of $235 million or 45 cents per share (27cents a share excluding one-time items). That topped Wall Streetestimates of a 46-cent per share loss. The company also increased its cash stockpile by $100 million duringthe quarter to a total of $2.3 billion. 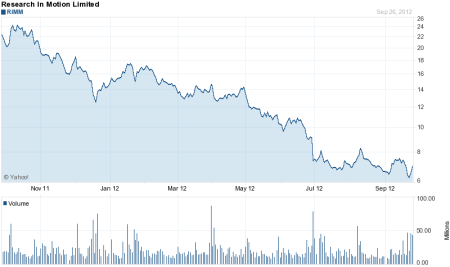 A one-year chart of RIM’s stockperformance tells the tell of the company’s slide in the past 12months. (Image: Yahoo Finance). RIM also revealed an upside surprise earlier this week when CEOThorsten Heins told the BlackBerry Jam developers conference that RIMhas actually added two million subscribers to hit a total subscriberbase of 80 million in the quarter ended Sept. 1. Yet overshadowing those tidbits of good news are worries aboutcompetitive pressure from Apple and Android devices, the delay inreleasing the new BlackBerry 10 operating system (it will debut earlyin 2013 after being postponed), and the fact that the bulk ofBlackBerry subscriber growth is coming from emerging markets wheremargins are slimmer. RIM’s Q2 revenues posted today were $2.8 billion,a 30 per centtumble from revenues of $4.2 billion in Q2 of fiscal 2012. During an analyst conference call, Heins fielded several questionsabout the impact of various factors on RIM’s average revenue per user(ARPU), including the expiry of existing BlackBerry subscribercontracts, the churn rate that sees BlackBerry users migrate tocompetitors’ handsets, and the lower revenues generated in emergingmarkets like some parts of Africa or Asia-Pacific, where RIM is seeingthe most subscriber growth. In the news release stating RIM’s Q2 financial results, Heinsreiterated that the BB10 OS will launch as planned in the firstcalendar quarter of 2013. Asked during the analyst call how RIM willcapture the attention of consumers when BB10 finally makes its debut,Heins said the company must expand its focus beyond enterpriseand cater to consumers driving the bring your own device (BYOD) trend. “I think there will be a lot of elements in BB10 that will excite theconsumer,” Heins said. “We need (to do) this in order to attract theconsumer in the enterprise.” He added that initial response fromcarriers and partners to BB10 and its features has been positive,boosting his confidence that BB10 will appeal to consumers in a bigway. Heins acknowledged that the onslaught of new devices launched bycompetitors during the upcoming holiday season will put even morepressure on RIM, especially since the marketing campaign for BB10 won’treally gear up until the holidays are over.